THE “COSTS OF CANONIZATION” of Martin Luther King, Jr., as Brandon Terry notes, have been the stripping of much of the civil rights leader’s political thought and praxis. We cherry-pick the quotes, refusing the broader indictment he leveled at the country. And we trap King in the South, missing his challenge to northern injustice and the limits of American liberalism from the beginning of the 1960s. Our popular rendering of King makes it seem like he only recognized the racial problem outside of the South after the 1965 Watts riots. Yet King had crisscrossed the North and West in the early 1960s, joining with movements there and criticizing the willful disregard of black protest long before the uprisings. He was severely attacked for it—often, as he pointed out, by people who supported his work in the South. 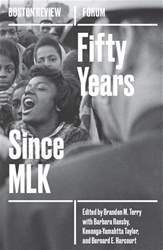 King doubled down, insisting that racial problems outside the South did not begin with the riots of the mid-1960s—as citizens, political officials, and the media suggested—but with the long history of injustice and frustrated black struggle that preceded them. Ignoring this component of King’s activism furthers the myth, popular then and now, that U.S. racism is peculiarly southern, brutal, and redneck rather than national, firm, and stubborn.